The 2014 Tapping World Summit is starting on the 24th of February 2013. This is the 6th Tapping World Summit conducted by Jessica and Nick Ortner. Nick and Jessica Ortner are brother and sister and I can tell you that they know how to deliver. Their contribution is not a selfish one ,they do lots of charitable work. I take my hat off to them. transformed his life. Do not miss it! The summit lasts for 10 days, this year you will get a bonus day, during which Jessica will interview two experts per day on different topics. Some of the topics that were addressed in previous years were Weight loss, Financials, Chakra healing, physical pain, emotional pain relationshipsand children. The good thing about the Summit is that it is free to listen. Yes all tapping interviews will be online, and you can listen to them for 24 hours for free. The exciting part is that you do not just listen to the interview but you can tap along with these experts. 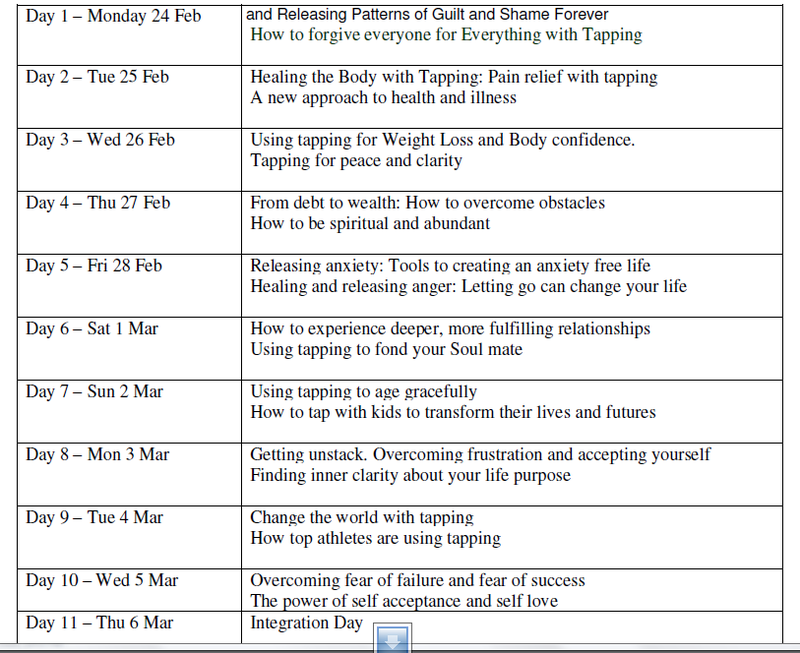 This way you can learn to tap, Some people have reported that by just listening and flowing these interviews for 10 days, they have changed their lives. It is an increadible opportunity to learn from the experts. . But to listen for free you need to register. To register you can click here. .
Once you are registered, you will receive an email every time the new interviews are ready for you to listen. Even though the summit has not yet started you can listen to the interview with Wayne Dyer. There is so much wisdom in it, you cannot miss it. If for some reason you cannot listen to the interviews during the 24 hour window, then you will have the option of purchasing the recordings, in addition to some workbooks with all the tapping script and some bonuses. You could als buy the recordings before the actual summit and you would get a special price, or you can purchase them after the recording. I urge you to attend the summit and try to listen to all interviews every day. It is easy to forget about it, but if you register you will get an email every day when the recordings are available. Mark it in your calendar and set aside two hours a day and commit to listen to them. If you take it seriously, you might chnage your life forever. Tap along with the experts, even if the subject does not concern you. By doing so, something will trigger, some emotion will come up, and you will be able to release it . When tapping you are supposed to touch some meridian points, but even if you are taping without touching the physical points, just by using your mind, you can get results. I read this in one of the EFT books, but I was doing this on my own long before I read it. You can read my review of the Tapping World Summit,.